The Babylonian name adopted by the Jews for the fifth month of the year, corresponding to part of the modern July and part of August. It always consists of thirty days. The first day of Ab is, according to rabbinical tradition ("Seder 'Olam R." ix. ; R. H. 2b, 3a) and Josephus ("Ant." iv. 4, § 7), the anniversary of the death of Aaron. Concerning the fast on the Ninth and the feast on the Fifteenth, see Ab, Fifteenth of, and Ab, Ninth of. The Eighteenth of Ab was once a fast-day because on that day the western light (ner ma'arabi; compare Tosef., Soṭah, xiii. 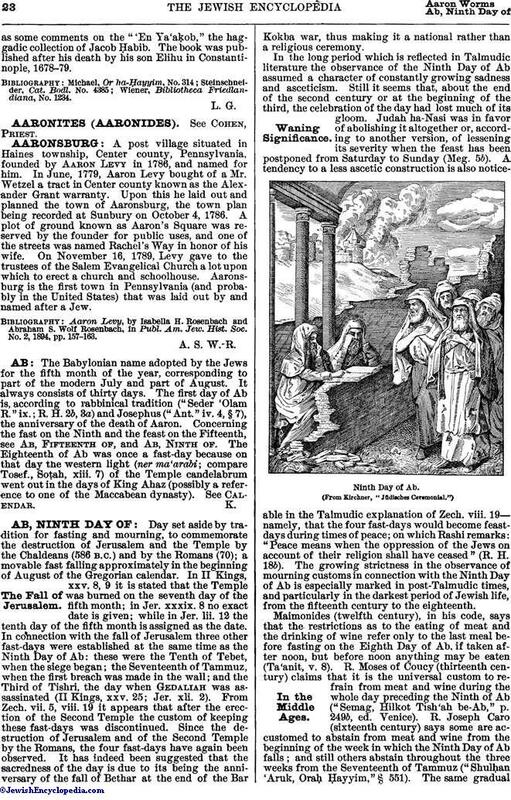 7) of the Temple candelabrum went out in the days of King Ahaz (possibly a reference to one of the Maccabean dynasty). See Calendar.